What is better than strawberries and cream? Well, maybe some chocolate thrown in there, but thats not what we are going to talk about today. I love strawberries and cream. 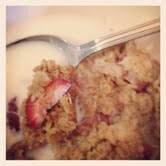 I love strawberry and cream oatmeal. But like, im in my 30's and i feel like an dork buying strawberry and cream oatmeal in the microwave packets, when i should be buying organic fancy schmancy oatmeal. This solves my problem. I promise you, this will solve every problem you have ever had. (at least until your bowl is empty). I changed the recipe a bit from How Sweet It Is, but i think my changes make it a bit healthier. Totally try this. Preheat oven to 375 degrees F. Spray a baking dish with nonstick spray – I used a 10×7, but you can use a smaller or bigger one. In a large bowl, combine oats, sugar, baking powder, salt and cinnamon, mixing until combine. Measure out the cup of milk, then whisk in egg and vanilla extract then stir it into the dry oats. Mix in mashed banana and melted butter, then chopped strawberries, then scoop the batter into the baking dish. Bake for 30-33 minutes, or until the edges are golden brown and the top is set. Remove and let cool for 5 minutes before serving. Top with strawberries, bananas and milk!